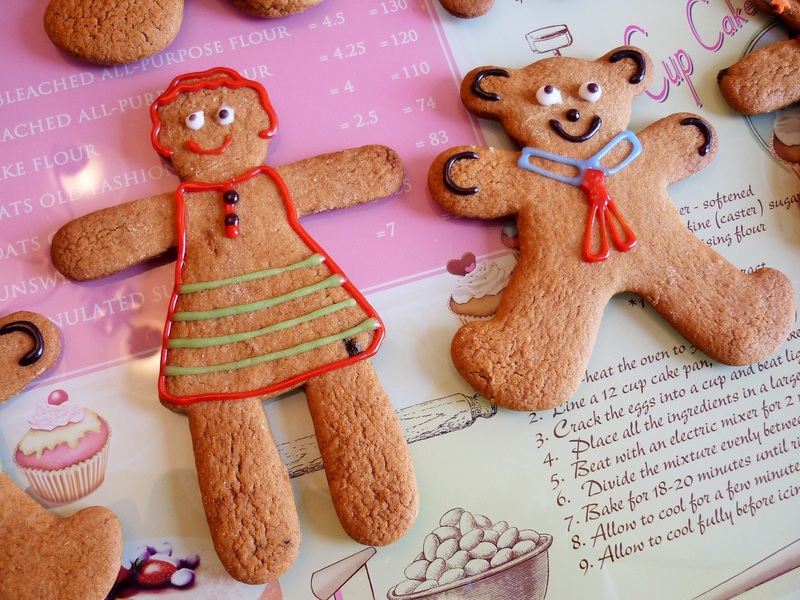 A red dress with green stripes and black buttons for this gingerbread lady. For the basic gingerbread mix, I used a recipe from BBC Food. 175g light soft brown sugar – I used dark brown sugar, but it’s a matter of colour preference! This recipe makes A LOT of biscuits! 1. Put the flour, bicarb, ginger and cinnamon in your food processor. Add the butter and whiz everything together until the mixture looks like breadcrumbs. Add the sugar and blend. 2. Add the egg and golden syrup to the mixture and blend. At this point my food processor gave up so I tipped the mix into a bowl and finished the mixing by hand, combining everything until I had a smooth dough. 3. Shape the dough into a ball, wrap in clingfilm and put in the fridge for at least 15 minutes. 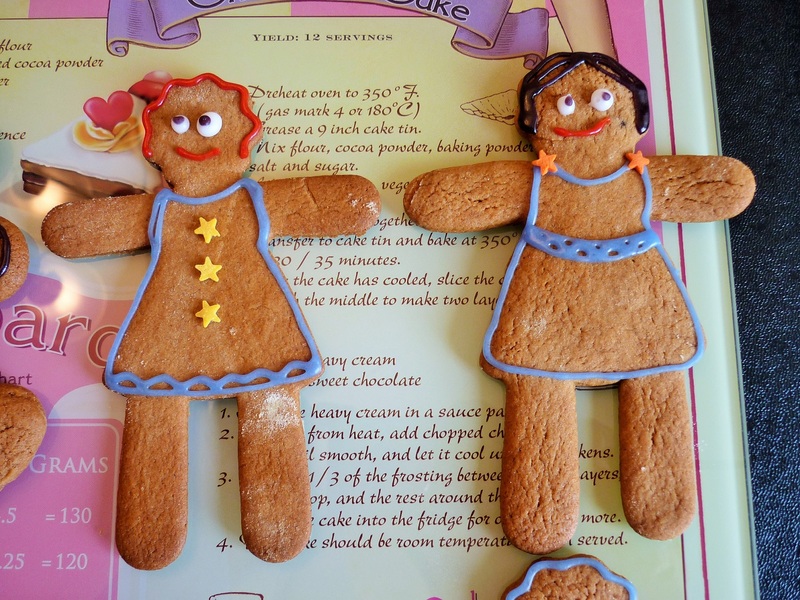 Gingerbread ladies in blue dresses with yellow and orange star details. 4. Preheat the oven to 180 degrees C. Line as many baking trays as you have with greaseproof paper (I only have 2 and had to keep rotating them, unloading and reloading each time a batch of biscuits was done!). 5. Roll the dough out until it’s about 0.5 cm thick. You will need quite a lot of flour to stop it sticking to your board and rolling pin. 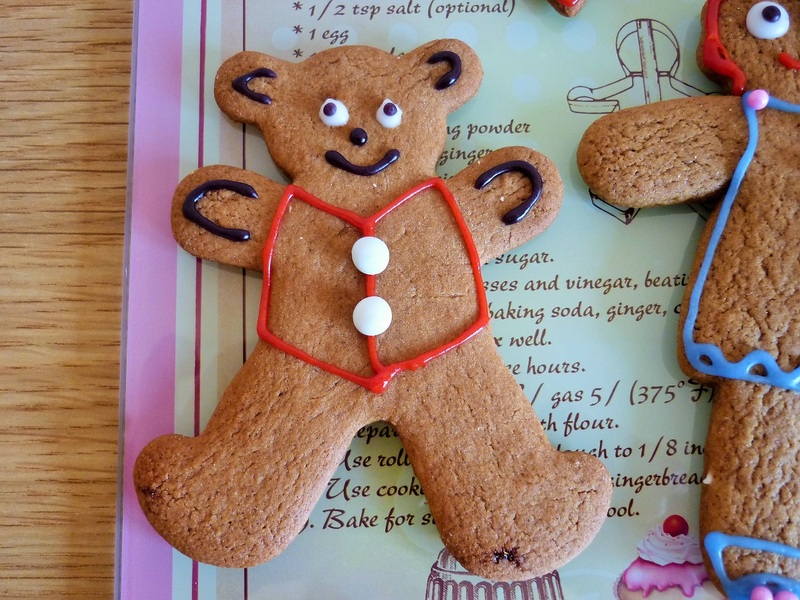 Leaving the dough thicker gives you a chewier gingerbread, but a rounder surface which is harder to decorate. Rolling the dough thinner gives you a crunchier gingerbread, but a flatter surface which is much easier to decorate. Your choice! I went for a mixture of the two options. 6. 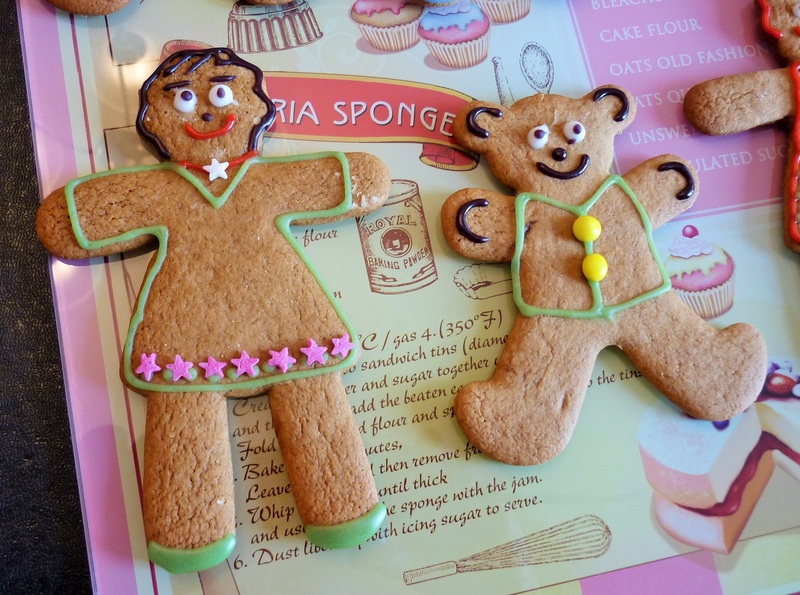 Use cutters of your choice to cut out your gingerbread shapes. I also did a few hearts to use up the “left overs”. 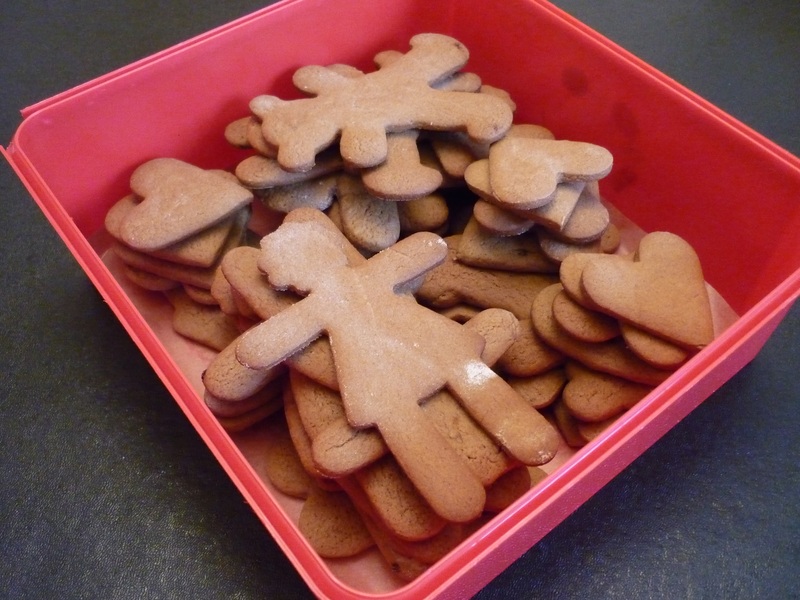 Put the gingerbread shapes on your baking trays, making sure you leave a bit of a gap between them to allow for any spread. 7. Cook for 10-15 minutes until golden brown. They can go from “cooked” to “burnt” quickly, so keep an eye on them. Leave on the tray for a few minutes and then transfer to a rack to finish cooling. 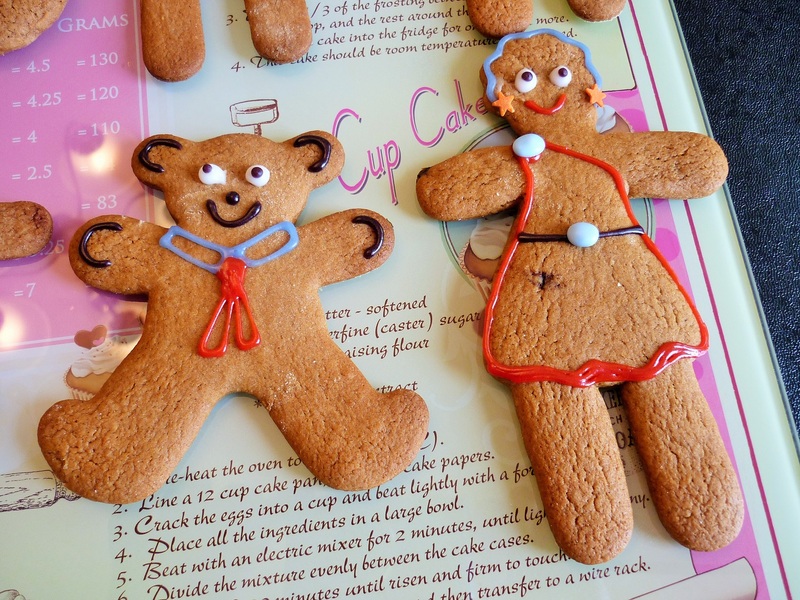 Gingerbread lady in an off-the-shoulder red number with orange star ear-rings. Teddy wears a snazzy red tie. A green number with matching green shoes, star choker and hem. Bear wears matching waistcoat! 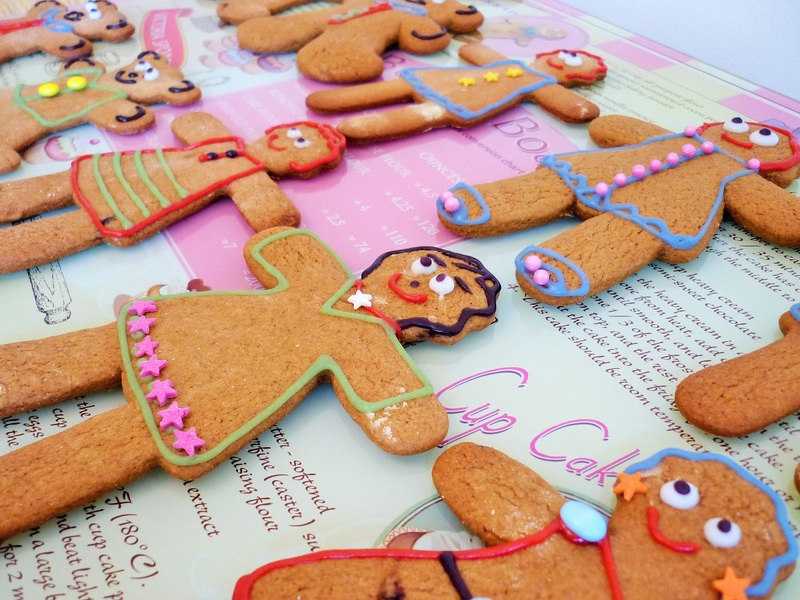 These gingerbread figures are easy to make, fun and colourful! My little boy really enjoyed helping me roll the dough and cut out the shapes. I gave him some of the more “squashed” looking biscuits to go mad on with the icing tubes. And he makes enthusiastic yummy noises when he gets one to eat. Went a bit mad with the pink sugar gems on her dress and shoes! A snazzy red waistcoat for this guy! Last picture – I promise! These are just brilliant. Must try them with the little one. She’d love it! Oh these are too cute!! How lovely. I know. It was almost a shame to have to eat them… hahaha! My Mum used to make these with us as children – always a winner which kept us quiet for hours, first for the decorating and second for the eating! Love the decorations- i can never get anything looking that neat! Thank you! I must confess that I practised first on a few hearts I made with the extra dough – they certainly don’t feature in the photos! 😉 But they still tasted great. I gave my toddler his own few to go mad on with the icing. They were… very impressionistic! 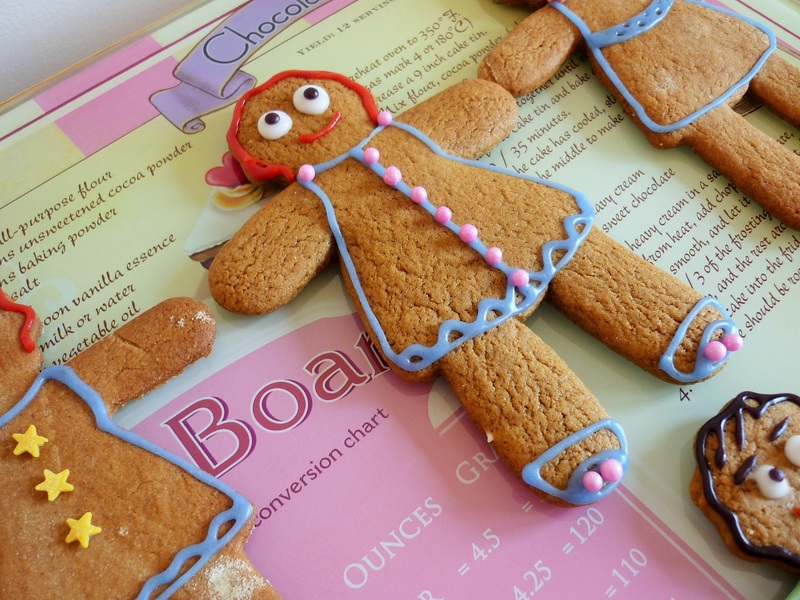 You should be posting some of these gingerbread fashionista’s outfits on those #ootd boards. 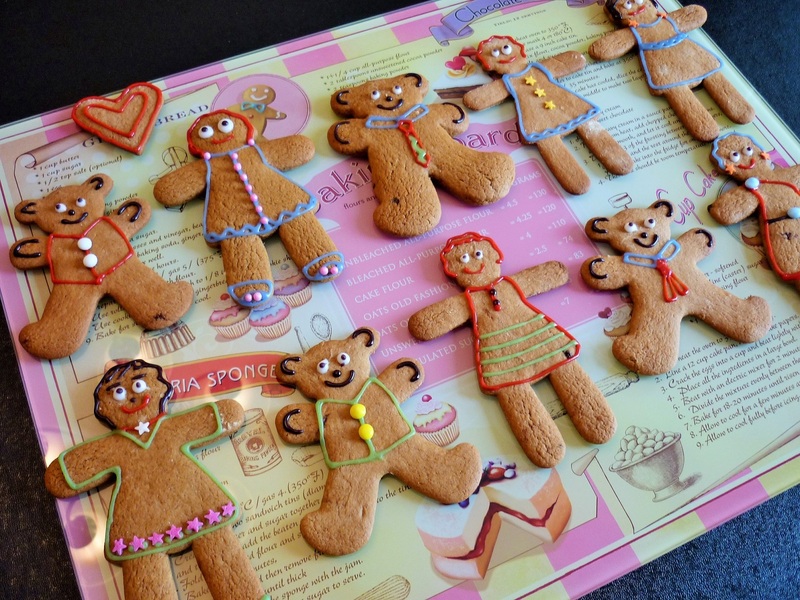 They look like more care and attention has gone into their looks than mine on an average day… Gingerbread Girl Power!